Better keep your head down today because we're off to Revolutionary France again to make the acquaintance of a man of noble blood who met a sad fate at the hands of the new regime. You'll be relieved to know that the shadow of the guillotine doesn't loom over us this time, though our salon guest did fall foul of the National Convention and from a privileged start, found himself in dire straits. 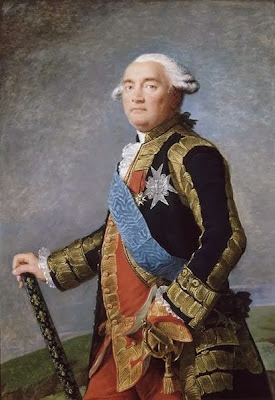 Philippe Henri, marquis de Ségur, was the son of a military officer, Henri François, comte de Ségur, and his wife Philippe Angélique de Froissy. The wealthy couple were favourites at court and enjoyed no small measure of political influence. Born in Paris, Henri was one half of a pair of twins though his sibling, Philippe Angelique, died within the day. Henri's education was intended to prepare him to follow his father into an army life and at the age of 18, he did just that. Placed in command of his own regiment, he travelled to Italy and Bohemia with his father before joining campaigns across Europe and quickly establishing himself as one to be watched. At the age of just 23 the marquis suffered a serious injury at Lauffeld that resulted in the amputation of his left arm. Undaunted, just one year later he was back in service and succeeded his father as Lieutenant-General of Champagne and Brie, gaining a reputation as both a strategist and a decisive commander. Not content with professional successes, Henri also made the obligatory good marriage match and in 1749 wed Louise Anne Madeleine de Vernon. Although the couple raised two sons, the younger of the boys was actually the child of Henri's friend, Pierre Victor, baron de Besenval de Brünstatt, who enjoyed a liaison with Louise Anne. With Henri enjoying one success after another, by the age of 30 he had also taken his father's former position as governor of Foix, ensuring the continuing influence of his family. He was a soldier at heart though and eventually Henri returned to the front, serving in the Seven Years' War. He was present at Minden and was taken prisoner in 1760, returning to his political career upon his return to France. As Minister of War, Henri proved himself a gifted politician, implementing popular reforms in accommodation and healthcare for soldiers. He received criticism for introducing a decree requiring that officers be of noble blood but this unpopular decision was not his and he adopted the policy under duress. Named as a Marshal of France in 1783, Henri resigned his political office in 1787 to return to his military career. As the Revolution swept through France, Henri found himself on the wrong side of the new regime, viewed as a hangover from the old ways. Imprisoned in La Force, by the time he was released the Marshal of France was left with virtually nothing. Stripped of his positions and wealth he struggled under vastly reduced straits until 1800 when Napoleon granted him a pension in recognition of his service to France. Philippe Henri died in Paris in 1801, never having the opportunity to regain his previous status or reputation. Like so many others, the Revolution laid waste to his earlier achievements, the once respected soldier and politician a shadow of the man he had been. Another enjoyable post; elegantly written and informative. I was in Paris a few weeks ago where my wife and I stayed in the neighborhood of l'Ecole Militaire. Philippe Henri would have been too old and too wealthy to attend. But there is an impressive, colorful pageantry to pre-revolutionary military life, of which we were able to catch a glimpse. Thank you! It has been too long since I was in Paris, I think I am due a trip; you are absolutely right in your summation of pre-revolutionary military life and you know that I am *very* fond of a bit of pageantry!